Unable to afford a wedding on their own or with the help of their parents, couples are mounting campaigns on crowdfunding websites asking for financial help. Detroit resident Elizabeth Rodriquez, 22, and her fiancé Otoniel Cabrera, 26, turned to crowdfunding site GoFundMe in January -- soon after Cabrera lost his job, leaving him out of work for months. So far, the couple has raised around $4,200 from seven donors, which will go towards their $28,000 wedding in April 2015. Their "Dream Wedding" campaign is one of more than 1,500 wedding-related campaigns that have been launched on GoFundMe.com since 2010. Many campaigns are framed like a reverse registry, with couples asking friends and family to rethink the traditional wedding gift. "We ask that any money you would spend on a gift goes towards our wedding expenses. Any little bit helps!" 21-year-old Ashlyn Walker wrote in May on her campaign on GoFundMe. Beyond the online donations, Walker said many friends and family members are helping in other ways. Her wedding dress is a hand-me-down from Schneider's aunt, while a family friend will provide catering services for just the cost of the food. 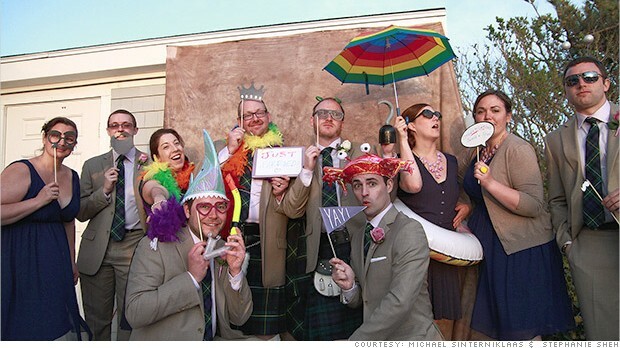 Etiquette expert Lizzie Post said that while "many a wedding has been thrown by a bunch of people pooling together resources," the new trend of online fundraising could create "awkward"situations, where potential wedding guests feel pressured to contribute. Last year, LGBT rights activist Jamie McGonnigal and his now-husband Sean Carlson were overwhelmed when $5,225 poured in to their Indiegogo campaign from dozens of donors, including friends and family, and even some people they'd never met. But there are some cases where people are willing to chip in -- especially when a couple is down on their luck.Still, McGonnigal said some people weren't as supportive. "I definitely got a lot of push back from a few people," he said. McGonnigal even found an online message board attacking the campaign. A month earlier, Ryans' parents had written owner Jason Stevens a check for $16,500, which he had said would cover the entire cost of their December wedding. Determined to help the couple salvage their wedding, Ryans' friend Erin Telford launched a GoFundMe campaign, "Save Brandi & R.J.'s Wedding" which has received around $7,500 from 142 donors. Ryans said their wedding will likely be "smaller and less frilly" than originally planned, but that the support they're receiving is "literally saving the day."